What is the query trying to do? The query is fetching all the record frm 3 tables using inner join and I am using pagination displaying it. I tried adding Indexes in all the column that im searching or connecting with and it improves that over all performance of the system. I am on the observation part now. hope that it fix the problem permanently. I'll close this thread later on when i validated that the solution is effective. I have an application that has thousand of records. the problem that i am having right now is that my website is performing slow.when i am trying to swtich to other link on the site which have a query running on the background it takes ages to load. i already tried using cloudflare to optimize the system but the slow querying still persist. can anybody have an idea that can help me optmize the poor performace of my database? By the way the system is hosted in a dedicated server but the resources consumption is very high. Hi never find got it already.thanks! Thanks for that but how can i remove the "" on the numbers? the format should look like this. Yes exactly put line 17-18 inside while loop. Hi! thank you for giving your inputs on this matter. fix the while loop query code (LINE 21), it is giving more then one record i guess. Yes it is giving me 1 or more records which is correct. coz for that day there are several client that have a billing duedate. If you generating mulitple files, then intialise excel object inside while loop and after generating file, destroy it before while loop ends. Yes and No. 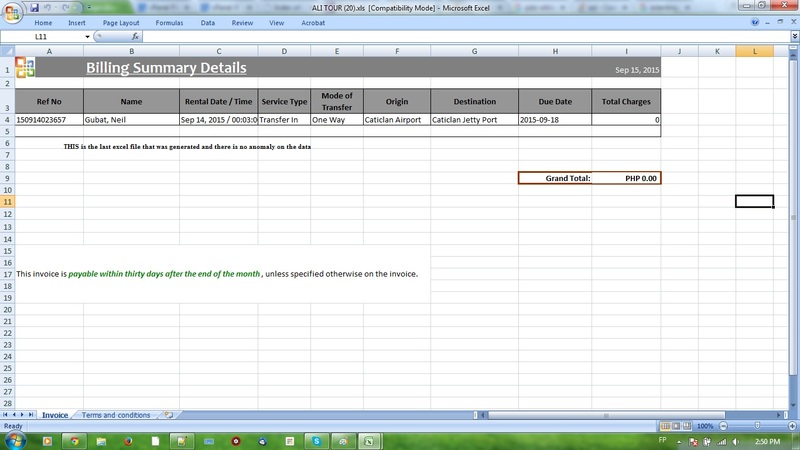 it depends on the client duedate whether it will create 1 or more excel file. Also what do you mean by ? Do i need to put line 17 and 18 inside my while loop? Im creating individual excel file base on the duedate and client name of a reservation and sending it automatically on that date.but im having a trouble dispalying the SUM/ Grandtotal of each excel summary that i created. the grandtotal inside my while loop is also incrementing. i dont now what i am doing wrong. for today i have 4 Client that has a duedate today. 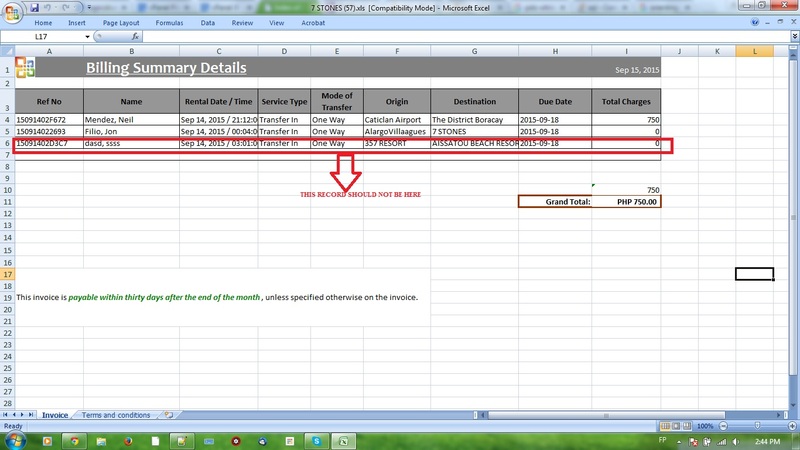 and the script automatically generated the excel file summary of each client. 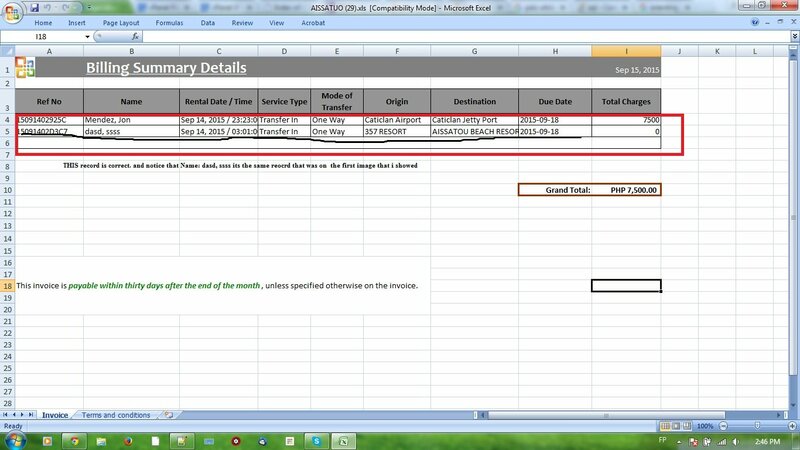 This is the Script that i used creating the excel files. Got it! Line 45 is the one causing the problem..i just remove that line and everything working fine. Hi jkon sorry for the late response. my sql dump was cleaned by a mod because of the sensitive data that was posted thats why it didn't match.basically what im trying to do is send an .xls invoice to the client 3 days before the duedate. what i am trying to do right now is collect all the reservations of each client dynamically and create individual.xls file for it. on the first image i said that the last record should not be there because its a transaction of the second image. i use the resfor field as identifier on the 2nd select statement to group all the data. Anybody have an idea whats wrong im doing? Hi jkon i am still orienting my self to pdo and still getting the feel of it.dont know yet most of the tricks and other stuffs. The "../includes/pdo_config.php" is just the database config of one of the table. (im using 2 db on this case) by the way i updated my script and its almost working but im still getting a wild data that should not be included in one of the excel file that the script generates. anybody has an idea what am i doing wrong? when i try to creat a excel file base on the list of name i got from the reservations table using a loop im not getting the right data on the excel file. notice the select query on both script. I dont know if the problem is the while loop or the foreach..
Re: Ubuntu and Zorin not opening thunderbird and firefox? Foud the problem. it seems that the on access scanning of sophos is the one causing of the bugs. Ubuntu and Zorin not opening thunderbird and firefox? Has anyone of you having a problem opening firefox , google chrome and thunderbird since yesterday? coz almost all of our unit that is running in ubuntu and Zorin OS are experiencing the same bugs.. i already tried updating and upgrading the OS but still having the error and i also tried re installing the applications but im not getting any progress..
after you made the changes you are ready to Go. can you run this script? please read http://php.net/manual/en/function.date-diff.php to better understand why you are getting that error message. Another thing your date_default_timezone is not correct please refer to this list for the correct timezone. please be more specific what error are you getting? the sample i gave you is working perfectly on my side without any glitch. dont put your if statement in a straight line if you have a comment on it. Your First script will work. you just need to make a cronjob for it to send the email automatically. No its not. the pc needs to be turned on for the task scheduler to work. the best option you have is yo use a cronjob on your webserver that will check your script on a given interval of time.